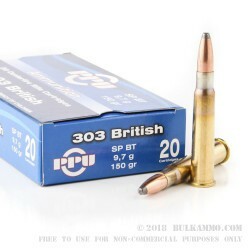 This .303 British load from Prvi Partizan is perfect for hunters using Enfield-pattern rifles. 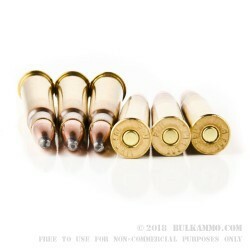 The 150 grain soft point bullet boasts strong expansion and leaves the muzzle at 2,690 feet per second, more than enough to make long-distance shots on medium and large sized game such as deer, elk, hogs. 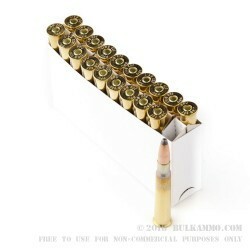 Each cartridge is new production with non-corrosive Boxer primers and reloadable brass cases. 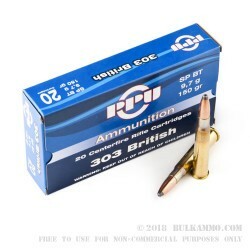 Prvi Partizan is known for producing more than 400 different cartridges, often serving as the only source of new production for older rounds long after other ammo manufacturers have moved on. The company is based in Uzice, Serbia, where it employs nearly 1,000 people and operates three factories. Founded in 1927, it served as a source of supplies for fighters resisting Nazi occupation of Yugoslavia during World War II and gained its present name as a stroke of propaganda afterwards. The company underwent privatization in the 1990s and has since established a flourishing export business.